Belissima amica!!! come stai?? 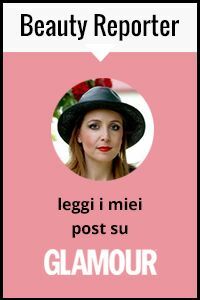 dove sei??? io sono un puo lontana de la vita virtuale ma anchora io sono tornata i con un nuovo notebook. I think this season's scarf prints are super pretty and unique. You look great. ..more then fabulous , love the top..so chic ..
You are gorgeous! I love that necklace and blouse! you look amazing, i'm in love with your litas! I love you blue shoes!!! i think that are great with blue panttoo!! love the jeffrey campbell boots! amazing outfit! Love the shirt - it looks just so cool! The blue shoes and pants look just great with the shirt. 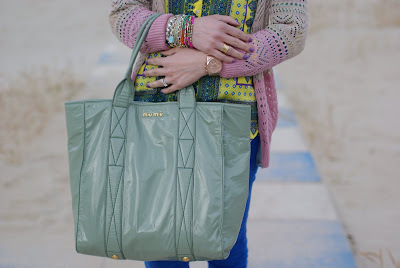 molto carino questo outfit,i colori ti donano molto! Outfit molto carino, borsa bellissima !!! Great outfit, especialy I like blue jeans and shoes! fantastic color! I love love love everything about this outfit, especially how you styled the sweater with the scarf, two prints, but they work SO COOL together. You have such a nice style ! This is the blue that I search everywhere! I want it in silk to make a caftan! Amazing colors! Really love it! Ma come sono appena stata da zara e quello spettacolo di camicia non l'ho vista! uh come rosico!! Belle le lita di quel colore!! The electric blue pants and the electric blue Litas look so nice together. Ciao!...Bello l'abbinamento dei Colori...il Tuo look merita un 10 & Lode!! So lovely, so Smart Look...Cheers!!! Carinissima la borsa :D Reb, xoxo. Thanks to stop in my blog. You're blog is amazing, I follow u! Thanks sweetie for visiting my blog, I already followed you! love the look! following! xoxo! I love the blouse and the necklace. You look stunning! tkx for ur lovely comment at my blog! urs is amazing, great fashion and ur really beautiful! This outfit is sooo lovely. I think that you put it together in a very creative way and am absolutely in love with it. 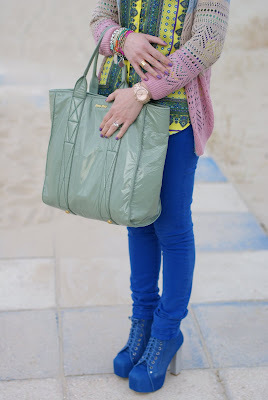 I love the blue pants and the black shoes with the pastelish sweater with your wonderful top. I was wondering if you could check out my blog. I just started it and I would love to have a good amount of followers by my birthday. very beautiful skirt, amazing prints! Love the connection between the pants and shoes! oohhh Litas! I LOVE JEFFREY CAMPBELL!!!! I really hope one day I will be able to afford a pair!